HILLIARD, Earl Frederick, a Representative from Alabama; born in Birmingham, Ala., April 9, 1942; graduated from Western-Olin High School, Birmingham, Ala., 1960; B.A., Morehouse College, Atlanta, Ga., 1964; J.D., Howard University, Washington, D.C., 1967; M.B.A., Atlanta University, Atlanta, Ga., 1970; lawyer, private practice; member of the Alabama state house of representatives, 1974-1980; member of the Alabama state senate, 1981-1992; elected as a Democrat to the One Hundred Third and to the four succeeding Congresses (January 3, 1993-January 3, 2003); unsuccessful candidate for nomination to the One Hundred Eighth Congress in 2002. 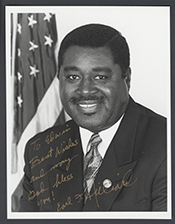 Earl Frederick Hilliard in Black Americans in Congress, 1870-2007. Prepared under the direction of the Committee on House Administration by the Office of History & Preservation, U. S. House of Representatives. Washington: Government Printing Office, 2008.